SearchReSearch: SearchResearch Challenge (2/28/18): How did this group of houses get to be here? SearchResearch Challenge (2/28/18): How did this group of houses get to be here? ... consequently, it's also full of stairs. Some are ordinary, but some are wonderful and beautiful. Here's one of my favorite places in SF, not just for the view, but also for the cherry trees that bloom in the spring, the steepness of the steps, and the freshness of the breeze off the Bay, all of which makes for a great morning run. Palace of Fine Arts gleaming in the upper center. 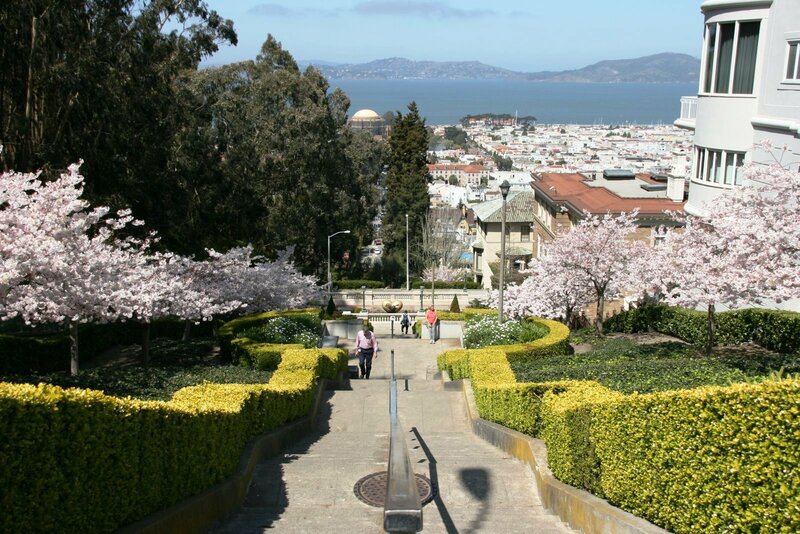 Lyon Street marks the eastern edge of the Presidio, the old fort in the heart of the city. It's the best repurposing of a former military base that I've ever seen. mysterious set of houses marked off in the lower right. As a former military base, the perimeter of the base either follows natural boundaries (e.g., the edge of Lobos Creek in the lower left), or is an arrow straight line. 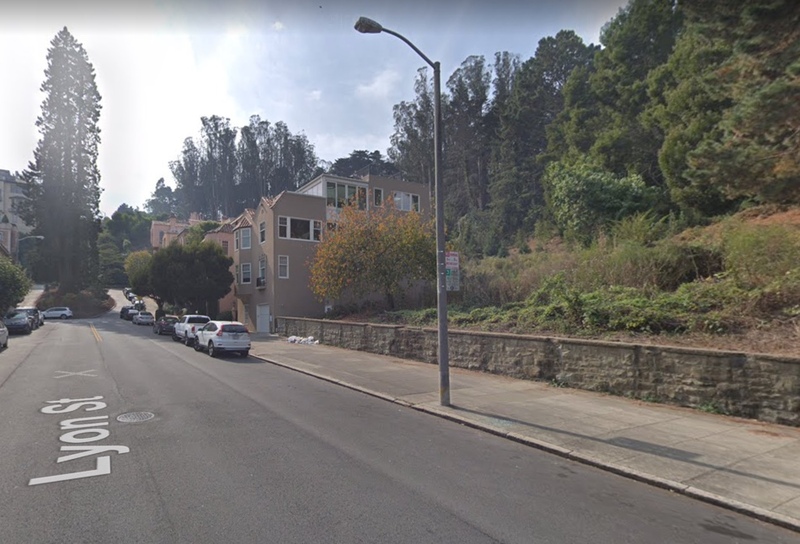 A Streetview image looking south on Lyon Street, towards houses that are inset into the edge of the Presidio. See those houses on the right side of the street? Why are they there? Those red-roofed buildings on the left are (former) military houses. The buildings on the right of Lyon Street are all civilian. But so are those six houses that somehow managed to sneak inside the boundary of the base. The Presidio has been here for a LOONG time. There's been a military fort in this location since 1776, when the first Spanish set it up as a forward base in Alta California. Nice find, jon. "Apolonario" Miranda's first name was probably Apolinario, unless his godfather and parents were really trying to be different, or just ignorant. It's worth reading this corporal's request to his military commandant, and the ensuing grant, as transcribed on John Dwinelle's The Colonial History of the City of San Francisco. That's awsome, Luis. HOW did you find that book? (The Colonial History of the City of San Francisco, which just happens to contain that grant.) What insight did you have that led you to make the query that took you there? Nothing too fancy, I'm afraid. After I read jon's answer, I searched [ "apolonario miranda" ]. I was trying to check if "Apolonario" was jon's typo or his source's. My reasoning was "if this was the guy's real name or was transcribed like this somewhere", it will be a really easy search. The first result is indeed that book. Historically, el Presidio was the northernmost military outpost of New Spain (Mexico) and was established in 1776 along with Mission San Francisco de Asis (Mission Delores). 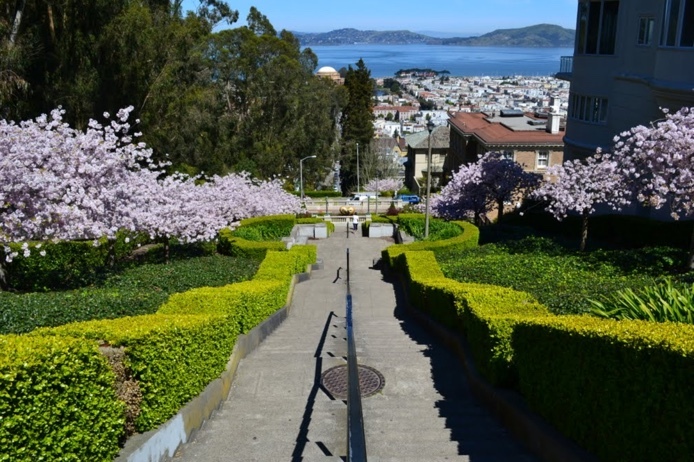 The Presidio of San Francisco, located in San Francisco, California, has a history spanning over 200 years, but its activities during World War II are of particular importance in regard to Japanese Americans and others of Japanese descent. School in the “Princess Diaries” movie. These six houses were built in 1924 & are actually just inside the Presidio border; all are on the Register of Historic Places so the facades can’t be altered. This could be the answer. Still no confirmation. Re 2601 Lyon Street that Ramon found. There is nothing about it or any of the 6 houses in https://noehill.com/sf/landmarks/default.aspx which lists all Landmarks in SF by National, State and Local interest. Finds on page 91: OJO DE AGUA DE FIGUEROA #159, San Francisco. Grant of 100 varas made first in 1833 by Gov. Figueroa and second in 1838 by Gov. Alvarado to Apolinario Miranda. Patent for 1.77 acres issued in 1877 to Miranda et al. In T 2S, R 5W, MDM. Varas are variable in use. However, This item says 100 varas=1.77 acres. The current very approximate size of the 6 lots in Miranda Tract is about 21,000 Sq Ft which is about .5 acre. So the original grant was about 3x bigger than what now exists. The source I cited in my comment to your first answer (The Colonial History of the City of San Francisco) dates the grant to November 16, 1838, as issued by the then Military Commandant, Francisco Sánchez. I wonder if civil governors could have granted military land. Nonetheless, it looks like the issue wasn't settled in the 1830s anyway. The first Google search result for [ "miranda tract" presidio ] is a 1897 article on San Francisco Call, accessible through CDNC (California Digital Newspaper Collection), here. Its headline reads "Lyon Street Is to Be Extended as the Eastern Boundary. An Affair of 21 Years' Standing Comes Up for Final Adjustment." Now I wonder what happened in 1876, that is, 21 years before 1897. I also wonder when was anything built there, apart from the house Miranda himself had already built no very legally. The current buildings are much more recent. According to the San Francisco Property Information Map (SF PIM), the outermost ones are from 1922, all the others, including the fancy central one, with street number 2601, from 1923. My first, and relatively unproductive, search was something like [ lyon street "presidio" "san francisco" "2525" | "2601" | "2637" ]. My reasoning for this complicated search was that any history of those *seven* buildings should mention the street numbers of at least the outermost buildings or the central one. I was wrong. Nonetheless, as I found out because of this search, the story of that tract of land doesn't quite finish in 1922/23. The Blue Book (old name for white pages) doesn't mention the street name on their 1924 edition, and the people who lived there in 1928/30/31 were living somewhere else before. This is also how I found a book where the central fancy building is said to be the set for some scenes of the 2001 movie The Princess Diaries. And in fact here it is on the movie trailer. Compare with Google Street View. perhaps they thought it would escape to space if it wasn't anchored? Dan, you're not running the steps 6 hours a day are you? did you notice all the trees on top of this house across the street? roof tree garden & street view did a 'cement shoes' number on this Tesla on Lyon St.
Six hours a day? No... not that much. The longest I've ever run was 4 hours (for a slow marathon a few years ago). been hacked, seldom used account, impostor, doppelgänger, multi-dans? 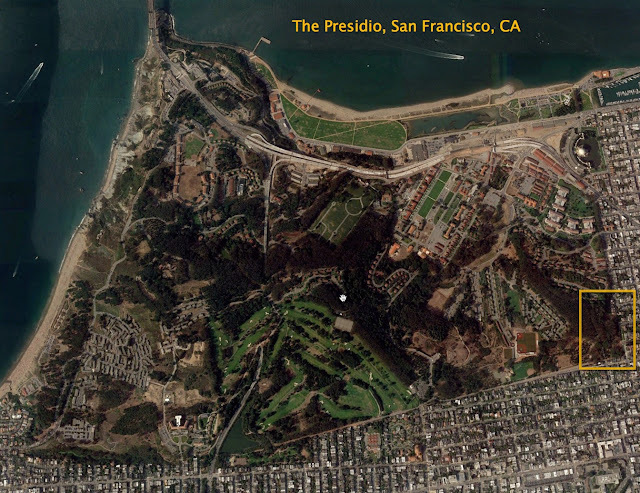 On the first one, I found out that there were other people living in the Presidio, including a Candelario Miranda. With this great taste for names, this family could very well be friends with the fictional Buendías of García Márquez's One Hundred Years of Solitude. The third one leads me to think that the Ojo de Agua de Figueroa was not the tract of land in question, but another one just outside the Presidio, which was also granted to Miranda (by the governor, this time). Arguably, if instead of searching the misspelled "Apolonario" I searched "Apolinario", the results would be better. In fact, the first result of the Google Book search [ "apolinario miranda" ] is Barbara L. Voss's The Archaeology of Ethnogenesis: Race and Sexuality in Colonial San Francisco (at Google Books). On pp. 163-171, a short but detailed biography of Juana Briones explains her relation with that tract of land and with her husband, including the transcription of her disturbing and powerful #MeToo divorce letter. As to the Miranda Tract being (or not) Ojo de Agua de Figueroa, and as to who exactly granted this/these tract(s) of land, I didn' reach any solid conclusion, but the last book I cited is probably the best of my secondary sources. I'm now forcing myself to stop searching, because I need to sleep. I had great fun though. . . .The street [Lyon] as dedicated traverses a small Spanish grant, sometimes called Miranda grant and sometimes the Figueroa grant, which included nearly 300 running feet of Lyon Street. . .This delivered to the city by its own attorney Lane. THe sum of $[6? ]500 was authorised to be expended in payment as the purchase price of land required for the opening and extension of Lyon and Green streets through the Miranda grant. The Board of Supervisors has already purchased the Miranda grant for $6500, so Lyon street may be extended and It Is now the duty of the Board of Works to proceed with the work. .
Great! I didn't know Elephind, already bookmarked, thanks! In the meantime, and inspired by this, I decided to search Google Book Ngram Viewer. The Pioneer; or, California Monthly Magazine, in its Vol. 1 (1st half of 1854), has a great article across several issus on "Alcalde Grants in the City of San Francisco", including transcriptions of a lot of documents. This is where I realized that Figueroa (the name on the property) was not only Governor but also military commandant of the Presidio (a general, no less). …is this the SF of the past or future? Clint… and Eric, musing… and winking emojis @ Princeton. It's always hard to tell where sRs searches will lead. Still poking around, I find that https://calisphere.org/item/a2e7e4d29f93b1c90f91855da4f36883/ has a photo of the Miranda Tract shortly before it was built upon--1919.
at the edge of the Presidio - she sounds like she, and her sisters, were remarkable women. "The wall separating the base from San Francisco is still there but no longer guarded. The Presidio is now part of the National Park System. Juana Briones' house is long gone, replaced by 6 mansions in today’s Lower Pacific Heights. The El Ojo de Agua Figueroa spring no longer flows but the strange border created by this bright, independent and pioneering woman remains. A sign that even an army and the US Government are no match for the will of a woman bent on controlling her destiny." "In 1833, Briones' husband was granted land 1,000 yards east, on another spring called El Ojo de Agua Figueroa. 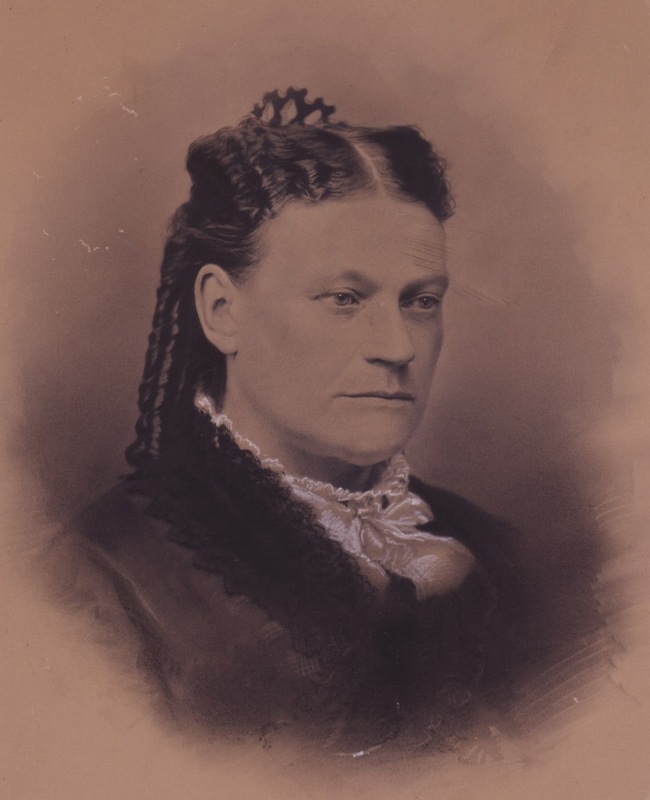 Briones and her family moved there, just outside the Presidio borders - thus becoming the first non-Indian San Franciscans to live somewhere other than on the Presidio or at Mission Dolores. The waters of the spring were visible until 1912, and it is said that they still run under the site of her long-vanished house." & "At the bottom of the steps, there is an odd indentation in the adjoining Presidio wall, a notch occupied by six houses. 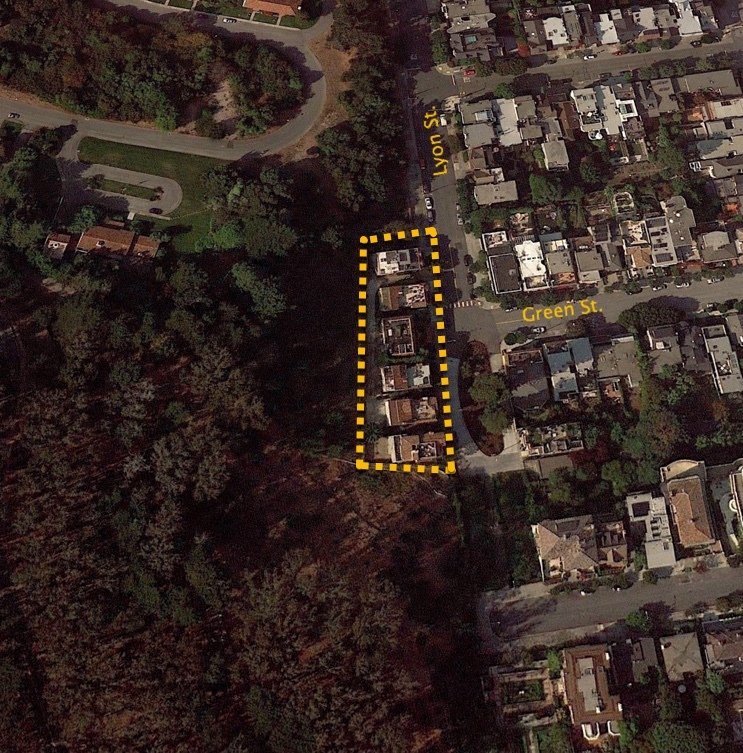 That notch in the otherwise ruler-straight Presidio boundary is a tangible reminder of one of the most remarkable and inspiring figures in San Francisco history - Juana Briones." The woman on that photo doesn't look a little bit Latina, much less mestiza as Juana Briones reportedly was. She also doesn't look like an elder version of the young portrait that was made many many years later based on the accounts of relatives who, reportedly, look like granma Juana. The largest resolution of this photo I found online is on a FoundSF page, a small historical essay on Juana Briones, where the photo bears the following caption: "This is believed to be a photograph of Juana Briones taken in the 1860s, but it has not been definitively identified. Image Courtesy of Point Reyes National Seashore Museum." I also found at least two reputable websites where this photo is indexed by Google but no longer to be found there. In sum, I strongly suspect that this lady is not Juana Briones at all. early photography history can be fuzzy - recall Dan's question about the Valley of the Shadow of Death by Roger Fenton? "landowner Juana Briones y Tapia de Miranda (1892–1889)—a woman of Spanish, indigenous, and African descent whose life spanned the Spanish, Mexican, and early American eras"
"In Colorado, accidentally released plutonium from the former Rocky Flats nuclear bomb trigger factory has permanently destroyed the integrity of the groundwater supply. Water now being widely used for Denver area swimming pools and playground sprinklers has been shown to contain plutonium, deadly in minute doses." was looking at the Presidio Wall itself… thought these houses were interesting too - although outside the perimeter. No shortage of notables around there. close to the time the Miranda tract houses were built - "Redevelopment forced some 30,000 bodies to be relocated in 1920"
The first photo was posted, most appropriately, on the subreddit r/morbidlybeautiful (https://reddit.com/6asz9i). not unlike the retouched/hand drawn additions to the purported Briones photo. how is it that he isn't there? I remember when I first took Dr. Russell's and Google's MOOC "Power Searching with Google" one of the videos there is made by Matt Cutts. So I am sorry and sad for he and his family for the passing of his wife Cindy Cutts. May she rest in peace and hope Matt and his family soon can find resignation and peace. He posted this sad news on his G+ profile. is there a book update? clearly MW is a fan/influenced by Casey Neistat…visuals, drone & music - should have had a 8 Mile glimpse… no steps. Willie the Wildcat needs to "work harder"™CN… skill is hard. also a runner - have you ever met f2f? one person's scenery is another… hey, where's Central Park? Answer: How much did this menu item cost? Answer: What's going on in these photos? Image searches with chip control!